A really under-rated feature available with Android devices is the ability to back up text messages to your Gmail account. 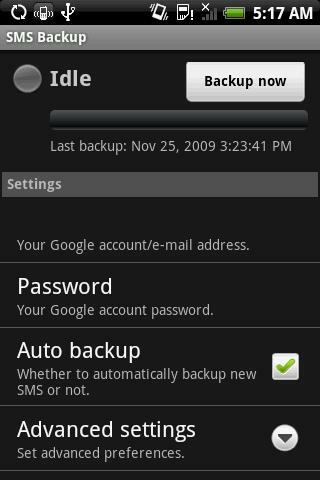 Look around for an app called SMS Backup. Using this tool you can specify your Gmail account details and your text messages will be automatically forwarded to your Gmail account as they are received. You will need to head into your Gmail settings and enable IMAP functionality prior to setting it up on your Android device. There are a variety of options available when using this tool. You can set it up to automatically forward the messages as they are received or you can set it up to manually enable you to forward the messages to your Gmail account whenever you like. It also has an automated feature which will back them up daily (or whenever) for you. If you don’t like the inbuilt automation function then you can always use Tracker in conjunction with the SMS Backup tool in order to get more out of your Tracker app (although this hardly seems worthwhile when the function is natively embedded into the SMS Backup app that comes with your phone). Some people actually prefer using a single tool for all of their automated tasks however. It actually localises all of the automated tasks into a single app so you can keep track of what is being done in an automated fashion instead of looking through a bunch of apps to see when the automated functions take place – some people end up with a lot of apps and having to scour the settings for each app is just not feasible in regards to the time it takes. You might already have a tool that handles the backing up of your text messages. However it doesn’t hurt to have an extra means of saving text messages. You might use text messages to field business queries and need to keep a separate record (for liability purposes) of all communications between clients. It also makes it a little easier to keep track of what was sent and received and when. If you do daily backups you can organise folders in your Gmail account that saves the messages from each day into a specific folder to categorise them. Gmail also allows you to search through messages so it affords an extra level of usability and power to the whole back up process. This tool is only for Android phones. When hunting for it makes sure you get the app written by Christopher Studer – it actually is endorsed by Google and has a Gmail icon in its logo. It is not only handy for business, but a great way to keep tabs on the messages sent to friends (and received) – although probably not a great tool for those of you out there that engage in illegal activity as it will automatically record any of your evil doings and is evidence in the event that you are in trouble with the law. It actually has a range of uses – but mainly, it is just a great way to keep track of your text messages and free up some space in your phone’s memory. Awesome advice to have a duplicate on text messages.